Walking onto real hardwood floors is a feeling unlike any other. The sound, texture, durability and beauty is not like anything else. However, vinyl is on the rise of popularity of receiving the hardwood appearance without the price. Below we will answer some questions you may have about the differences between hardwood and luxury vinyl floors. What is LVP and how does it compare to hardwood floors? Luxury Vinyl Plank (LVP), similar to Luxury Vinyl Tile (LVT), is a photographic image layer between a vinyl core and a clear wear layer to look like real hardwood, even down to the texture. Commonly mistaken for laminate or other types of hardwood floors. It’s mainly used in commercial or high traffic areas but can be seen more in residential areas due to the selection of colors, patterns, and sizes. 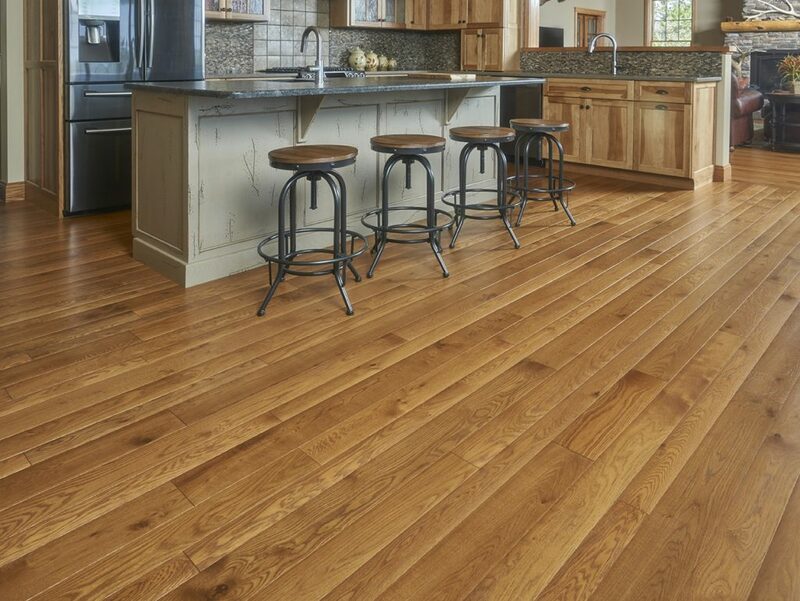 Real hardwood flooring is a solid board that comes from a harvested tree that is cut, dried, and milled to perfection to become a timeless floor. Manufacturers today are producing wider planks and longer lengths with endless prefinished stain color capabilities and a selection of authentic textures that are hard to reproduce by a machine. We understand some homeowners are searching for floors to withstand muddy shoes from children who came running through the house after playing outside or the accidental water spills from the fridge. Advertisements today highlight that you can purchase hardwood floors that are “life proof,” but what you may not know is that these floors are LVP and “the bottom line is that 100 percent waterproof floors are a myth” according to Know What’s Below: The Challenge with Wood Look “Waterproof” Flooring. Watch out for different types and grades of luxury vinyl because sometimes they can be more water resistant. As long as you follow instructions, LVP is a great flooring option for bathrooms and laundry areas when you want a wood appearance but are concerned about moisture. Real hardwood and water do not go well together because even after drying and milling, wood is still living. There are vessels in wood that act like veins, transporting any development of moisture through the plank, which can lead to cupping if there’s too much moisture. Hardwood floors can still be found in kitchens as long as you make sure any liquid spills are cleaned up in a timely manner. What is great about LVP is that it’s a cost-effective way to update your home without breaking the bank. In addition, if you are someone who likes to do your own home improvements projects, it should be an easy task for you to install yourself. However, if resale value is important to you, vinyl typically will not raise the value of your home. It’s great for when you’re wanting a quick easy update to your house that is budget friendly. How does the appearance compare? The sky is the limit when it comes to LVP options. There are various options from size, color, design and even texture. Advancements today have created vinyl with a textured surface to not only appear but also feel like wood grain. As much as LVP may “look” like wood, nothing can compare to the natural beauty of real hardwood. The authentic textured details of grain pattern and natural character charm of wood is not easy to replicate – not only to the eye but also to the touch. Harwood floors are timeless. Each plank has a story from the forest, through the hands of a craftsman, to becoming a one-of-a-kind hardwood floor. Its appearance and the overall story behind each board is something that cannot be distinctively replicated. How do they hold up to kids and pets? Vinyl is known to hold up to scratches so there shouldn’t be much concern if your toddler is playing with a plastic toy that skates across the floor or your dog goes running through the room with sharp nails. These floors are also prone to absorbing shock so if a plate comes falling out of the cabinet, the vinyl shouldn’t crack or chip. Now there are instances where damage can be done and this leads to the floor needing to be replaced since vinyl can’t be refinished. Something you may not know about hardwood is that there are species that are more durable than others and hold up to everyday wear and tear. 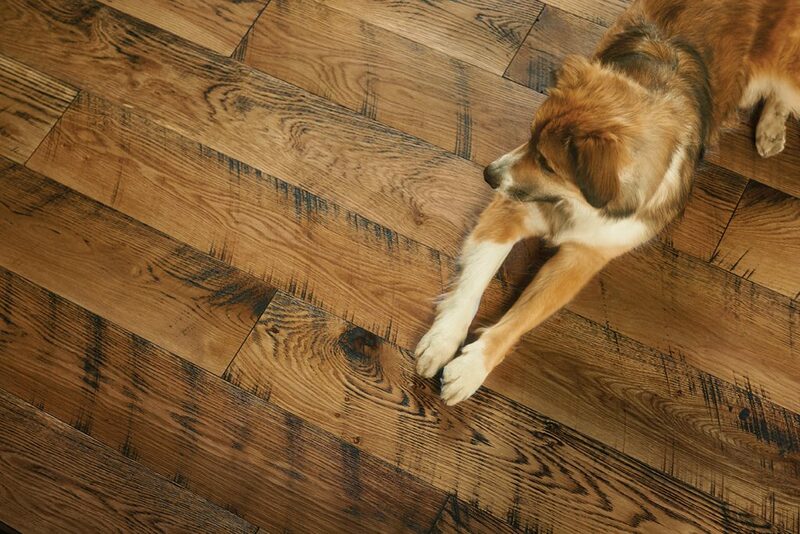 Hickory, Hard Maple, Red or White Oak are great hardwood choices if you have children or pets. For accidents that do leave scratches or wear on the floor, hardwood floors have the capability to be sanded and refinished. However, a hidden beauty of hardwood is that any blemish adds more character and creates a story for future generations. Are there anything health considerations? Both flooring surfaces minimize accumulation of dust and animal dander due to being a flat surface that is easy to clean. However, some LVP emit gasses and volatile chemicals (VOCs) into your home. This can be harmful to someone with respiratory issues so make sure you look for something that is low VOC. Not to mention, they aren’t biodegradable so they will sit in a landfill for the rest of time once thrown away. There are some exceptions but it compromises quality, durability, or safety. When it comes to hardwood, they are eco-friendly. Wood can be restored and used as flooring, known as reclaimed. This is a popular floor choice due to containing a lot of character and history while taking consideration of being ecological. All hardwood floors, old and new, improve air quality since they don’t harbor microorganisms or pesticides. There are finishes that are environmentally friendly as well and emit no VOCs. It will smell and feel as though you’re living in the outdoors without all the side effects. Whether you’re looking for something cost friendly or something that will last for many generations, the decision is yours as to which flooring best suites your lifestyle and needs. If you’re interested in hardwood floors or would like to learn more about them, explore our website or give us a call, 717-667-9373.